Discussing past, present and future with Double Fine's founder. Tim Schafer, the designer of all-time PC Gamer favourites like Grim Fandango, Full Throttle and Day of the Tentacle received the BAFTA Fellowship last week in recognition of his creative contribution to games. 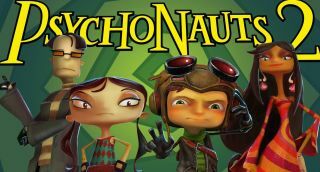 Along with much of the staff at Double Fine, Schafer is currently working on a sequel to cult classic Psychonauts 2, which was successfully crowdfunded in January 2016. We never seem to pass up an opportunity to talk to Schafer, and at EGX Rezzed last Friday I sat down with him to ask how Psychonauts 2 is coming along and whether he'd be interested in remastering more of Lucasarts' treasure trove of adventure games—even if they weren't games he worked on. How does receiving the BAFTA Fellowship make you feel? Besides old? It's really nice. It's coming from an organisation that values creativity and tries to encourage that in a generation of young talent, and that's something I feel like we've always tried to do as a company, so it feels very relevant and important to recognition—and a very heavy trophy. It was an interesting spread of winners this year—particular Edith Finch winning Best Game. That sends a strong message. Those are great games. It was nice to see Night In The Woods and Gorogoa win awards, as well as Hellblade winning so many. Double Fine is at an interesting mid-point between developer and publisher. How has your role changed in the last decade or so? Well, some things are new, and some things are the same. I still try to hold on to the parts of the job that I love, like writing. I'm still writing on Psychonauts 2, I'm hard at work getting all those cutscenes and levels writing done. But we've added a lot more things with an eye on the industry at large—trying to be a good heart of the indie games community, doing things like Day of the Devs and Double Fine Presents. There are so many games out there that disappear, and we want to help showcase the ones we think are the best. So I've added that kind of stuff, but I've left the parts of the job I'm not good at or don't enjoy like biz dev, money raising and work schedule. Team management I've sometimes left to other people smarter and better people than me so I can focus on still being creative, but still reaching out to the industry at large, trying to be a good citizen. You've talked a few times about the amount of games out there, and the struggle to stand out. Do you feel like you've found the right way of getting games to a larger audience? Yeah. There are actually a lot of indie developers doing this now, like Finji, who are helping out other indie developers. We're picking games that really stand out to us, or speak to us, and need what we have to offer. We're not sitting on a huge pile of money, though we are investing more and more in the publishing side. We've been around a long time. We know how to do everything from crowdfunding to relating to platform holders to how to get featured, how to outsource—all those things a developer might not know on their first game out. A lot of that is the hard work and curation of Greg Rice, our VP of business development, who runs Double Fine Presents. He's spending time at the show checking out all the games, seeing what stands out and meeting developers we might want to work with. We talk about it too, as a team, we play the games. At lunchtime we invite the whole company at Double Fine to come play some of these new games and see which ones we think are special. You've gotten pretty good at the crowdfunding process. Are you less reliant on work-for-hire than you used to be? To make a game as large as Psychonauts, we needed help from a publisher and that's when we really put together a flexible source of revenue. We have our own back catalogue now from games that we've self-published, like Brütal Legend on the PC, and all of our games that we've published we build to generate revenue from them, and every time we have a big Steam sale or a Humble Bundle we'll generate more money we can invest back into Psychonauts 2. But we also have Starbreeze publishing. So I think crowdfunding is still a great way to serve underserved markets like adventure games and things, where publishers might not be able to risk money on [them], but it's also a great way to connect with your strongest advocates out there in the community who really want to be backers, not just financially but emotionally and spiritually. Can you talk about how Psychonauts 2 is coming along? Yeah, we have about five level teams cranking away on the mental world. In Psychonauts you go into the minds of people and see their inner demons and fight the nightmares. We have multiple teams working on new levels for that, and we just did an update about the level teams and how they work. I'm almost done writing the cutscenes for the game, and we're just starting to look at casting for the voices. When you make move the release date of a game, like you did with Psychonauts 2 in December, do you feel more pressure making those decisions when it's a crowdfunded game? No, not unless you're asking for more money from them, because we're not. With Broken Age we doubled the length of time we'd take to make the game, but we also put in a bunch of our own money to match what the backers gave it. I feel like we're saying, thanks for waiting, we do apologise it's taking a while—so don't apologise. because that decision is to make a better game. You see announcements in the news about, 'oh, this game slipped' and everyone's all mad. The real bad news is the game's getting shipped when it's not ready. That's the opposite of that news release, right? And no one ever sees that announcement, because they don't make that announcement, but that's where the players really suffer—not from having to wait for a good game. You've got former 2K Marin design director Zak McClendon as your lead designer on Psychonauts 2. What's that collaboration like? Zak is an experienced leader of design. He worked on BioShock 2, a really great version of BioShock, and he brings a lot of expertise to the mechanics and the tuning and the physical side of level design and a lot of things we wanted to improve on in the second game. We felt like we can still do story and creativity and art really well, but we wanted to improve the platforming and level design on a mechanical level. I think he has a lot to offer there. How is your studio divided across different projects right now? We've got two games [going ahead]. After Brütal Legend, we split into four 15-person teams instead of one 60-person team. Three of those together is Psychonauts, and another team that's working on a secret unannounced game. So I always want to have multiple games going on because it gives you some perspective, flexibility and variety in the company which is important. That moment where you split into those four teams felt like the start of an important new phase for Double Fine. Definitely. And it was a great growth moment where we got to have people like Lee Petty, Tasha [Harris], Nathan [Martz] and Brad [Muir] run their own projects. Everyone got to try something new and everyone got to move up. We got a whole bunch of new genres nobody had ever done before. It helps us be nimble, trying to do something like Iron Brigade which was a mechanics-first type game rather than a story or narrative game. It lets us try to do things Once Upon A Monster or an RPG with Costume Quest and not bet the whole farm on it every time. What was it like to revisit your old games for the recent remasters? It was the kind of thing I had to give my permission to do. I've always had an instinct to stay away from the past, make a game, move on and make the next game. Don't rest on your laurels. You should always be trying to pull out new ideas. But then, 20 years go by for some of these games. It's been enough time that there's some value in going back and looking at them. Also, they were falling apart. They weren't available anymore, they didn't run so you'd have to pirate them if you wanted to buy some of them. We thought it was time. Also, the source material was ageing. A lot of it was on tape drives that are crumbling. Some of the team had passed away. While everyone's still around, let's make a definitive version of this game. We can get the team back together to comment on it, and gather that art, go to the archives and find what we can find. So we made versions of the game that are really phenomenal, and they gather a lot of that source material so you can see who we were at the time we made that game, who the team was. We can also do things like remix the audio, have it cleaner and not compressed. Between that and Psychonauts 2, then, you have opened yourself up to the idea of looking back. Yeah. Although Psychonauts 2 is a sequel, and we don't usually do that, but the story is a whole new chapter and it's something I wanted to do back when I made the first game. I had these ideas for how that story would continue, and being able to wrap up some of those loose ends that we started in the first game has been really satisfying. With the Lucasarts remasters, you've now worked on your major projects there. Would you be open to taking on Lucasarts adventure games that could do with similar treatment, even if they're not games you worked on? We'd love to, and in some ways it's up to Disney, if they want to do that, obviously, and if the original creators want to be involved, you know. That's what makes those remasters special, that the original creators came back and were able to say what to improve on, what to leave alone. If Disney expressed interest in doing sequels to your older games, would you be interested in doing that, or are you all about owning your own games now? The reason I started the company was to own what we make, so it is important to me to own them, and I had to be talked into doing those remasters on the business side. Our biz dev person at the time, Justin, was like 'you should do this'. [And I was like], 'we don't own them, what's the point?' and I'm really glad we did decide to do them, even though we don't own them. First of all we made money off of them, which is something I couldn't do in the past. We made money off Full Throttle, but we sold more copies of Grim Fandango this time around than the first time around, and so that was exciting to be a part of. And also, I got to make sure they were done right, and still be associated with the new versions of the game and not let someone else do that. That was really important to me. So I'm glad we did that. I would like to own them some day, mostly just to make sure I can preserve them. We lucked out, we made those remasters [with people] that were fans of the old games at Disney and at Lucasarts, and people still wanted to see those kept alive. What do you think the state of comedy in games is now? I feel like it's getting better. There are a lot of indie games that are really funny and light-hearted. The games industry dwells too much in the over serious, the grim hero of action games and hyper-macho things. The film industry is not known for being super inventive all the time, but even they have comedies every year and romance. Those things are not well-treated in mainstream games very often, but indie games I think have shown the way, by being games about anything. Making games that are funny, making games that are serious. Jazzpunk and West of Loathing come to mind as great comedy games of recent years. Jazzpunk is particularly great at allowing the player to play a role in creating jokes. I feel like interactive comedy is all about giving the comedy tools to the player. Giving them the wacky ability to squirt ink on everybody, or act and behave bad. It's like you're staging a play and there's this drunk improv character in the middle of it being rude to everybody, and that's the player. You've got to react to that, and as long as you give the player good props and good costumes to wear, and good actions they can do, they'll have a lot of fun, and be able to be funny. What's it like working with a Psychonauts 2 team made up of both fans of the original game and people who were fans of it? I think it's an important mix to have, because you want people who remember the special ways you made the first game stand out, how did you achieve that, and to remind you that we had some of the same problems with the first game that we had in the second game, insofar as there's periods where the level has to be rebooted. We rebooted one of the worlds five times, I think, and it's good to have that kind of perspective on it. Then it's also good to have people who don't have that history, who just started with some new ideas and new ways of doing things that can make the game better. How has your writing process changed over the years, and how is that conveyed through your work? When I do the remasters and I read my old writing, I remember how I was feeling when I wrote that. I feel like my process is still really similar. I do a lot of free writing, I do a lot of brainstorming, and I do a lot of writing locked in my office. I try to absorb the characters completely in my brain, and then treat it like improv acting where I act every part out as I'm writing, and I think that is basically the same. I feel like I've been through more as a human being, and that I've lived more, and that that's made me more empathetic towards human beings, and so maybe that comes through in the writing a little more. I worked really hard to become a better writer, and that's harder to do when you get more established—to find more ways to improve your craft, but I think it's really important. Even after you feel like you've arrived or succeeded, you don't stop learning how to do better, because I think that's the only way to have a long career—to always be getting better.